Outdoor kitchens are a wonderful bonus to any home. Whether you like to entertain large groups of people or just enjoy spending time in the great outdoors, an outdoor kitchen not only extends your family’s living space, but it also adds value to your home. Cooking is both easier and healthier in an outdoor kitchen as well. The Countertops are the primary place for food preparation and serving, but they also provide an extra level of protection for the cabinets and appliances below. That’s why protective and weatherproof outdoor materials are so important. Countertops in your outdoor kitchen maximize workspace and beauty in a variety of materials and colors. 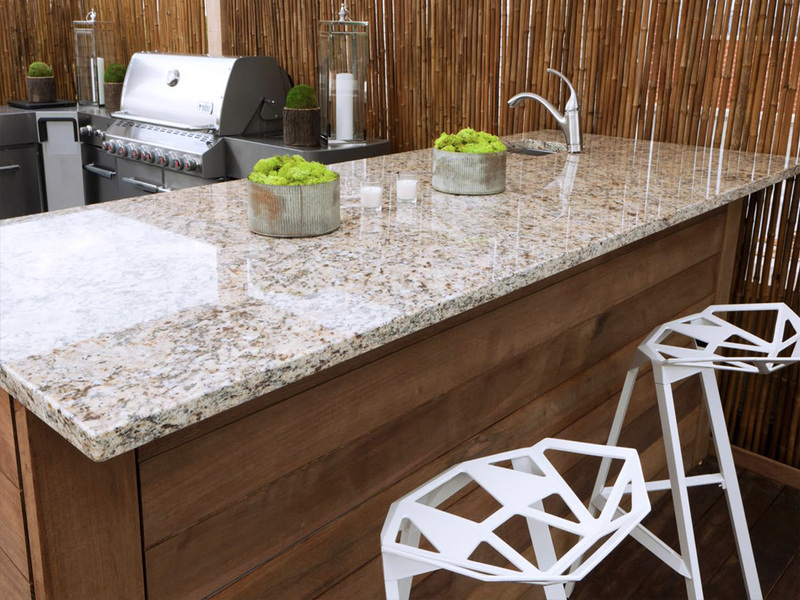 Granite may be the best option for an outdoor kitchen countertop. It’s UV and scratch resistant and is nearly nonporous, so it’s very water resistant. Marble can work perfectly as well, if you get it honed and don’t worry about etching and staining too much. Marble is extremely durable and will age beautifully outdoors, especially for those who like the rustic look and also a easy clean-up, essential for years of use. Your new granite countertops will look fabulous but how should you keep them looking that way? Talk to our professionals to see if the countertops require a seal. Sunshine and rain will naturally wash away stains from food, but if the surface is absorbent then you can apply some kind of sealer to prevent spills from things like wine or mustard from leaving behind a long-term mark.